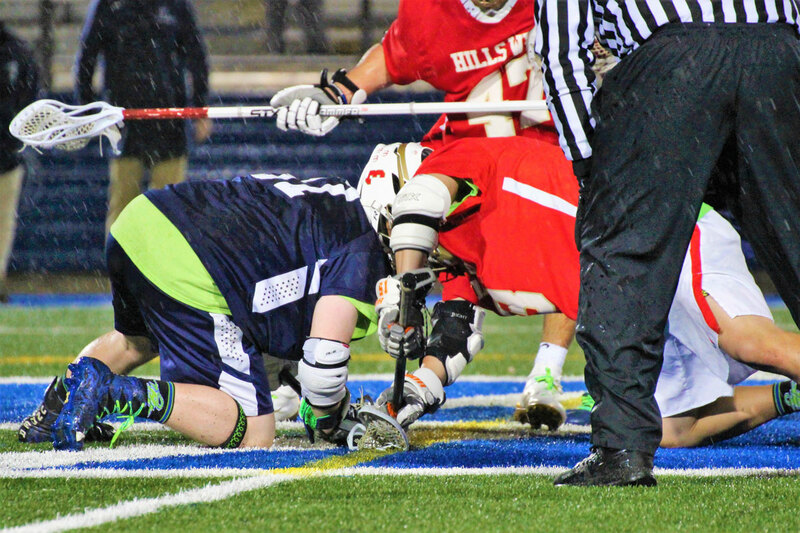 The Blue Devils trailed 8-5 at halftime, but outscored the Colts 7-3 over the final 24 minutes. Robbie Smith led Huntington with four goals. The freshman has 18 goals and an assist this spring. 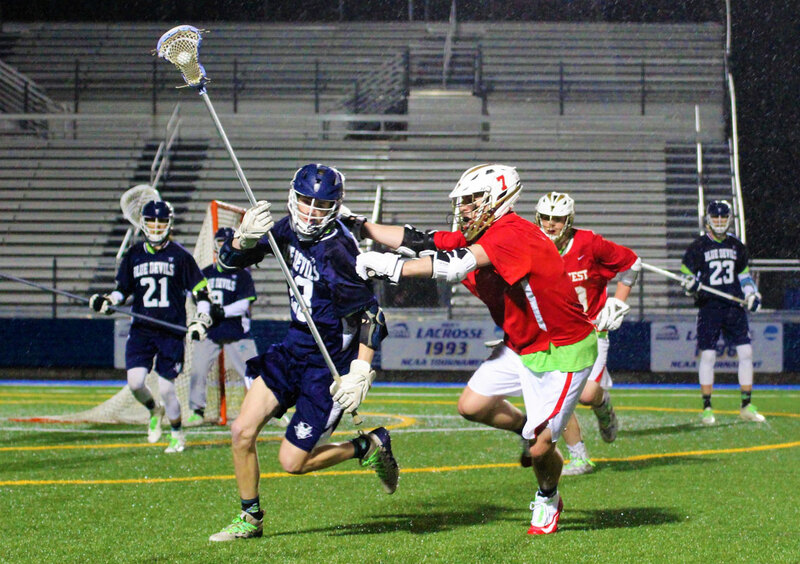 Liam Hasset scored two goals and added an assist. Jonathan Koumas also scored twice in the game. Jordan McCoy had a goal and three assists. Pat Durand and Jack Krisch both tallied a goal and an assist. Luke Luckow also scored a goal. Huntington goalie Aedan McDonald recorded seven saves in the cage. The Blue Devils’ defense held Hills West at bay in the final minutes of the closely fought game. Despite the wet weather, both teams enjoyed playing on the Hofstra Stadium turf field. The non-league victory improved Huntington’s overall record to 5-4 this season. The Blue Devils are in the hunt for a playoff spot in Suffolk Division I. Huntington plays a non-league game at Cold Spring Harbor on Thursday night at 7 p.m. There are home games remaining with Lindenhurst, Southampton and Northport and away contests at Sachem North, Commack and North Babylon. 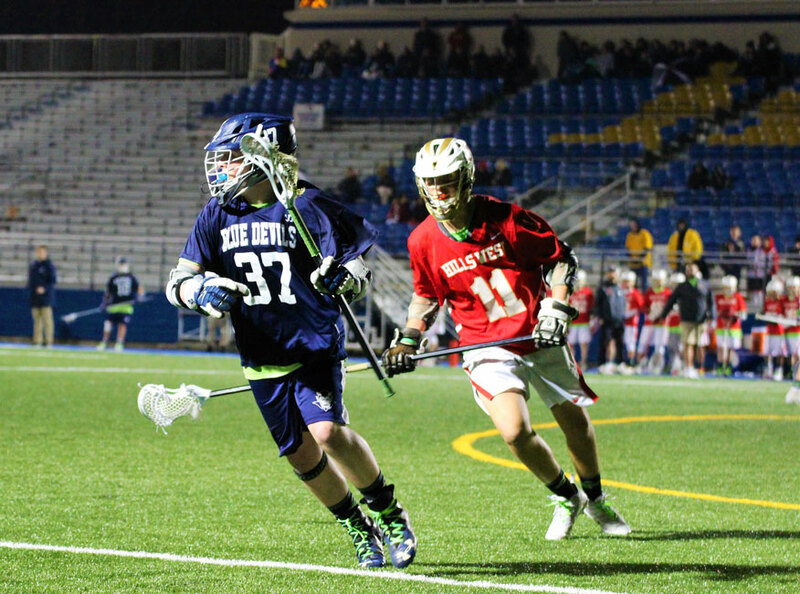 Last night victory was the second one-goal win in a week for the Blue Devils. Entering the week, Huntington has four of its last five games. The Blue Devils are striving to continue their hot play. Coming from behind to best Hills West was a confidence booster for Huntington. As the regular season hits the home stretch, second year head coach Julian Watts is pushing his team to keep playing well and pay attention to all the little things. 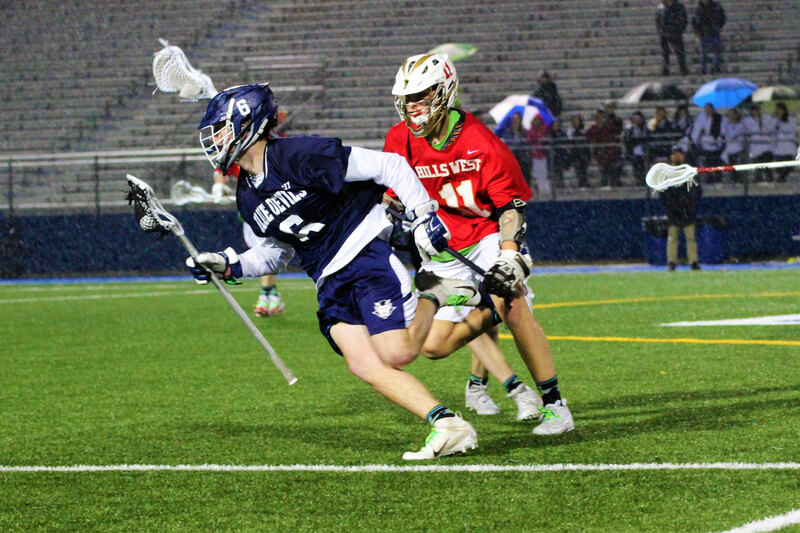 Catching passes, picking up ground balls, playing tough defense and “getting everyone involved” have taken on heightened importance as the Blue Devils drive to secure a playoff berth.